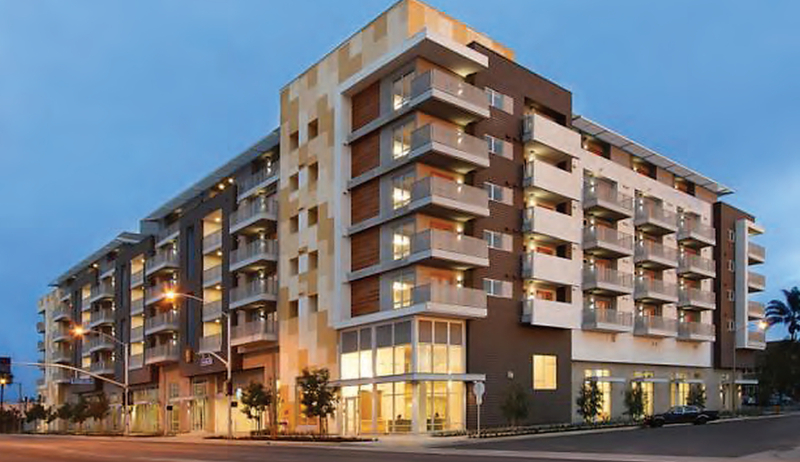 Along with honoring the Governor George Deukmejian Courthouse in Downtown Long Beach, the Los Angeles Business Journal (LABJ) also recognized the Long Beach Senior Arts Colony, naming it the Best Multi-Family Project of the year. This follows the Colony’s string of accolades: the Multifamily Executive Affordable Housing Project of the Year, the Multi-Housing News Award of Excellence Gold Award for Best New Senior Development, PCBC’s 2013 Gold Nugget Grand Award-Winner for best Senior Housing Community, as well as a design award from the American Institute of Architects. The 286,379 sq. ft. structure at was largely funded through Prop 1C funds—a state initiative that encourages development that is public transit oriented—because of its location at two of the busiest transit-heavy arterials in Long Beach: Anaheim Street and Long Beach Boulevard. Anaheim is home to the highest number of buses in use within Long Beach Transit’s fleet, while Long Beach Boulevard acts as the Blue Line’s main thrust through the city. Even more, the Colony alters the way that senior and affordable housing is approached—and that is bridging, not widening, the gap between the affluent and less affluent, according to architectural firm Studio One Eleven. In order to do that, one must engage in interaction—and for this project, that means building a 12-story market rate unit tower right next to the Colony. Studio One Eleven aimed for mixed-use that not only provides commercial space below the units—a common theme among today’s developers—but also provide community and recreational space that span between all buildings through interconnected pathways. Take, for example, the alignment of art studios that line the sidewalk below the Senior Arts Colony; this will not only encourage activity, but people on the sidewalk will pass by and see said activity, increasing their curiosity and engagement. Additionally, the project intelligently and tastefully uses cheaper materials to make a beautifully well-made product. Its use of concrete blocks to simulate wood, even down to the reflection and varnish add class without the cost. Or, for example, how the six-story building towers over the central, south facing courtyard. A developer building for market rate units would typically set the top story or two back, providing dimension that would make the courtyard feel more open and less encapsulated. However, Studio One Eleven opted for a much more nimble approach by simply painting the top floor a differing color, giving the illusion that the sixth floor is actually set back.